This week's edition is going to be a bit short, as I've been ill Monday and Tuesday and don't feel as spry as I usually do. The good news is that I'm feeling a little better so I can finish this up, and should be back to my usual self by next week. So please forgive, and enjoy, this abbreviated column. Because it's so important, I'm repeating the top story from last week: The search for a someone to officially take on the role of Director of First Edition has begun. The search is being headed up by Executive Officer (and current Chair) Maggie Geppert (jadziadax8), and is expected to conclude by the end of April. The director position, which historically has been known as the Brand Manager, is responsible for ensuring the smooth operation of the 1E department. As the recruitment article says, "...the primary work of the Director of First Edition will be in managing information about the expansion leading to its release: developing spoiler schedules, coordinating with the Department of Communications to advertise the expansion, etc. They will oversee the department staffing, filling vacancies as needed, and serve as arbiter for all internal disputes." Applications are open through this coming Monday, April 15th, so please apply if you're considering the position. Two weeks ago, five (5) players drafted and played in the Spring Break Masters in San Diego, California. As we've mentioned, Kris Sonsteby (LORE), or sitting Director of Organized Play, emerged victorious with the only Romulan deck of the day. I reached out to Kris for some details about his deck, his drafting, and the Silver Tin draft format. You ended up being the only player and getting the first pick? What advantages did these factors give you during the tournament? Having the first pick allowed me to take Cytherians, which meant that I had at least one shut down space dilemma combo. Unfortunately, nobody ever encountered it because the starter deck missions are so balanced it was hard to decipher which ones my opponent planned on attempting. Being the only Romulan player in the field meant I could focus on dilemmas / artifacts for the first 10 or so picks and leave the affiliation specific nouns for later. Dan Hamman (SirDan) and Johnny Holeva (jjh) both threatened to defensively draft some of the Romulan stuff as we progressed, but I don’t think either of them ever did. With just 20 picks each and all of Premiere at our fingertips, doing so would have been a tall order. I can honestly say I never even considered it. Nabbing Crystalline Entity, Shaka, When the Walls Fell, Hologram Ruse, etc. up front and still having Tallus, a D’deridex, and the Devoras available late meant I was drafting quality cards from start to finish. What types of decks and strategies were you hoping to face? Which ones did you hope to avoid? 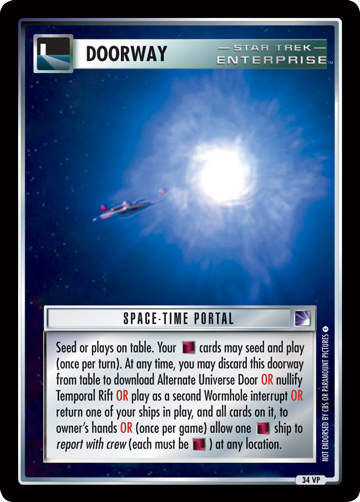 I expected the games to be largely solver vs. solver, and without the benefit of a seeded Space Time Portal I was therefore hoping to play against decks I could outgun with my trio of Romulan warbirds. While there wasn’t any specific deck I was hoping to avoid, I was thankful I dodged Nasty Nate W.'s (Naetor) Telepathic Alien Kidnappers / Static Warp Bubble hijinx simply for the annoyance factor that would have presented. Prior to this tournament, did you have much experience playing in a Silver Tin Draft? How about sealed in general? What did you learn about 1E draft/sealed that you didn't know before? I had never played in a Silver Tin Draft or anything comparable prior to this tournament. While I have participated in countless OTSD and Starter Deck II sealed events in the past 20 odd years, all those gigs were played under the Open format rather than with OTF rules. It was intriguing not to have to worry about or plan for mission stealing, while also being cognizant of needing to solve both types of missions, and that certainly altered my draft strategy. Although I have to say I missed Open format just a little bit when I pulled a banned Time Travel Pod in my sealed Premiere booster pack. Which cards did you draft that outperformed your expectations? Any dark horse picks? Alternatively, which cards did you draft that let you down? Drafting the Q-Net became a winning move when I picked up a second copy in the post-draft booster pack, although I feel like I over sold the value of Betazoid Gift Box. It was neat to dial in universals or ships for future turns but it was impossible to choose wisely as the starter deck dilemmas have such varied skill requirements. I also threw away a pick by taking Investigate “Shattered Space” before checking to see how many Astrophysics the starter deck had (hint – the answer is not nearly enough.) The only real dark horse selections that don’t seem to add much but were very important in reality were Galathon and Varel. The starter decks can get starved for plays and draws mid-game if you are not careful, but adding just two more universals kept the play 2 / draw 2 engine running smoothly. Surprisingly, the MVP award for this event probably has to go to Ambassador Spock. 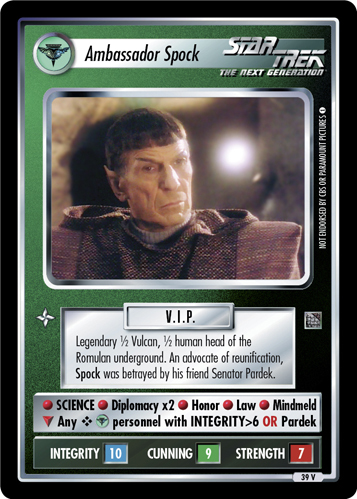 While there are not many Romulan Underground folks in the starter decks he can download, each time I played him he fetched me someone which pushed the card play count up to three for that specific turn. It doesn’t sound like much, but in a play 2 / draw 2 environment every little bit of card advantage helps. Spock also did the heavy lifting against Dan’s Gomtuu Shockwave in what was essentially the title match during Round 3, so I gotta give the game ball to him. Which cards were you hoping to draft that you didn't get? It would have been nice to have say five more picks, if only to grab Selok, Movar, and maybe the Khazara. Nothing really critical, but another All-Star mission specialist, another guy with mission skills, and / or another big ship would have come in handy. The downside of having the first overall pick meant I had to wait out nine other picks before having another shot at drafting something powerful, and naturally The Traveler: Transcendence, Barclay’s Protomorphosis Disease, Transwarp Conduit, etc. were all long gone by then. Not mine per se, but I do want to take a second to thank the Coming of Age designers and play testers for their hard work balancing out the starter decks. I don’t think many of the games were decisive blow outs one way or the other, and it felt like each affiliation had their own unique strengths and weaknesses. As a result, all of these Masters-level games were filled with exciting moments… whether it was Thomas Vineberg (Exon) losing a crew to his own Tarellian Plague Ship after beaming over a Medical for Dan’s copy of the exact same dilemma OR Nate pulling off a lucky win over Johnny because his Hyper-Aging somehow connected, there were thrills around every corner. How do you feel about Silver Tin Draft as a format? Aside from the general, do you think it (or similar sealed/draft) are viable formats for future high-level events? The Silver Tin Draft was awesome. Flat out, undeniably awesome. I cannot wait to use these crazy looking silver bordered cards in the next TNG-era constructed deck I use, as I will fondly remember where they came from. I would love to play in a Silver Tin Draft again, and hope I get the chance to in the future. If not, I might just have to run one myself up here in Frozen Chosen country. Conceptually, I love the idea of breaking the status quo and hosting high-level events under the sealed / draft format. These are perfect for players of any skill level, and they force competitors to get creative and make decisions on the fly rather than run the same boring old constructed design they have played for years on end. In the sealed deck environment, anything can happen… and it probably will! In the United Kingdom, a pair of sealed 1E tournaments took place. Paddy Tye (KazonPADD), the host, claimed victory in the morning OTSD + Reflections event with a Federation Triple Treaty deck. In the afternoon Block Sealed event, Damiel1701 emerged victorious with the Coming of Age Ferengi starter, slightly modified with some extra block cards. Both events featured eight players, which is notable and worthy of celebration - congrats Paddy on a great day! In Chicago, Illinois, four (4) players gathered for some OTF Constructed Complete action. Tournament host Michael Moskop (comicbookhero) took advantage of his wife and daughter being out of town for the day to win the event with a not-yet-posted Federation/Vulcan deck. Jason Beyer (sevencrdspud) and Brian S (JeBuS) took second and third, both with Federation decks, while Ed Pigman (jindrak) took fourth. I hope that everyone had fun and enjoyed the games! Finally, the first Romulus Regional was held at Lock Yard in Brooklyn, New York, where Robin Honeycutt (robin1234) emerged victorious in a field of eight playing a Maquis/KCA deck called doesn't need to kill you, were faster then you. The other travelling players, Mark Panna (shambinks) and Bruce Parrish (Captain Parrish) took second and third, while bar/restaurant owner Christopher Ghiorzi (RomulanAleSmith) took 4th with a Starfleet deck. I encourage all of you to look at the tournament results, because all eight decks are posted and there are two tournament reports. Congrats to everyone, with extra for Robin on his victory! Meanwhile, if you played in any events, scheduled or unscheduled, formal or casual, let us know! Send me an email or a private message, and I'll be happy to advertise your event or games to the world in a future column. My contact information is at the bottom of every column each week. Two Regional championships take place this weekend in the United States. The first, in West Melborne, Florida, has three (3) pre-registered players but I'm expecting to see more show up to play. Host Daniel Matteson (OKCoyote) is bringing his daughter Avery, who has several Tribbles championships under her belt. Sean O'Reilly (Jono), the other registered player, is looking to win a back-to-back title and his fourth overall. What will happen? We'll find out next week! On Sunday, in Ypsilanti, Michigan, Jon Carter (ptfi) is hosting an OTF Legacy Constructed event, with five (5) players pre-registered. Legacy is the card pool that allows backwards compatible cards in decks, which were recently removed from most 1E card pools. David Bowling (tomek), a multi-World Champion, is a huge fan of 1EC cards and an innovative deck builder. I can't wait to see what he brings! But Jon Carter is the 3rd ranked 1E player in the world at the moment, and no slouch himself. Or will Robin Honeycutt dominate and continue to regain his streak? Or perhaps Jarrod Cafaro (Takket) will use his forum experience to his advantage and upstage everyone? Perhaps the same is true of Aaron McCullough (aabecame)? It's exciting, and I can't wait to see. Q's Tent (4) is the victory, the sole survivor, and the champion. It was a close final match, but Q's Tent won with a 59-41 victory over Alternative Universe Door (7). Did you think this PAQ era card would emerge when the bracket was first posted? My predicted winner was Continuing Mission! It's good to know that some of the oldest cards are still some of the most popular cards. And speaking of champions, we ended up with one-hundred sixteen (116) valid entries for the drawing for a full set of Tournament Series N promos. Please note that the only invalid entries were ones without an actual email address provided. After collecting all the entries and drawing one at random, I'm pleased to announce that Lucas Thompson (edgeofhearing) is the winner! Congratulations, Lucas, and you'll be getting a full set of Series N tournament promos sent to you soon! However, with so many entries, I've decided to also award three (3) door prizes. That means that Derek Marlar (winterflames), Dan Van Kampen (Iron Prime), and a 3rd individual who hasn't responded to my email yet will each get a random 1E promo from my personal collection. Four (4) winners, twelve (12) promos, and sixty-three (63) matches. Your votes - hundreds of votes - declared Q's Tent the victor! I hope that you all had fun participating. Is this something you'd like to see again in the future? Let me know! That's all for this week's roundup of First Edition news and events. For more news, you can follow The Continuing Committee on Facebook, Twitter, or bookmark our front page. News about upcoming First Edition projects can be found in the most recent Project Status Update from March 2019. If you've got an event coming up and you'd like to be featured in this column, or if you have comments about this column's content, feel free to contact me at cplaine@gmail.com or on the forums via PM to MidnightLich. Until next week, may you expand your power in the universe and live long and prosper. 2 V 1x Birth of "Junior"
5 V 1x Do You Smell Something Burning?